They were also three times more at risk from having allergies such as hayfever, researchers in New Zealand found. Allergies are also on the rise and since 2001 the numbers of patients receiving treatment for some form of allergic reaction or intolerance has increased by 25 per cent. Meanwhile the popularity of Calpol - whose main ingredient is paracetamol - has steadily increased in recent decades and it now occupies 50 per cent of the market of drugs taken for pain and fever relief. Researchers at Otago University in Wellington studied 1,500 babies and young children up to the age of six in Christchurch, New Zealand. Their study, published in the journal Clinical and Experimental Allergy found that 95 per cent of the children were given paracetamol - and were far more likely to suffer from asthma or allergies. They cannot be sure why there appears to be a link but some experts believe paracetamol causes changes in children's body that make them more vulnerable to certain inflammations and allergies. Professor Julian Crane, who led the study, said: 'The major finding is that children who used paracetamol before the age of 15 months (90 percent) were more than three times as likely to become sensitized to allergens and twice as likely to develop symptoms of asthma at six years old than children not using paracetamol,' Crane said in a statement. Paracetamol is by far the most popular painkiller, having overtaken aspirin which fell out of favour due fear over its link to a potentially deadly condition known as Reyes Syndrome. This latest study adds to growing evidence that paracatemol is somehow linked to an increased incidence of asthma. Two years ago a major study published in the Lancet found that the drug increased the risk of wheezing amongst six and seven year olds by almost 50 per cent. More than 5.4 million people in Briton suffer from asthma, of which 1.1 million are children. 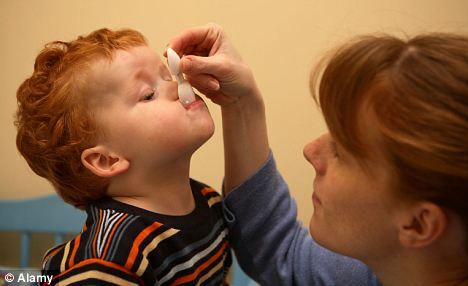 Dr Elaine Vickers, Research Relations Manager at Asthma UK said: 'Several studies from around the world have suggested there may be a link between giving children paracetamol and an increase in their risk of asthma and other allergic conditions. However, they have not established that paracetamol causes asthma.